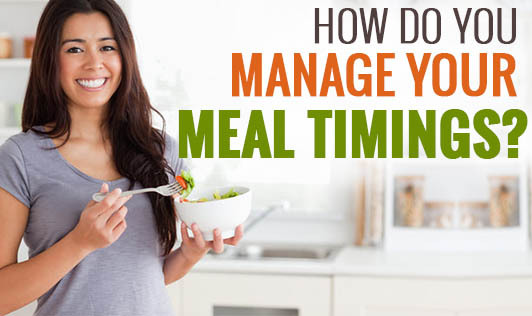 How Do You Manage Your Meal Timings? Managing meal timings becomes a major problem for most people especially in the corporate world. People get so busy and lost in work that they forget to eat on time. So, here are a few tips that you can follow to have 6 meals a day and maintain a healthy lifestyle. • Keep reminders on your phone or computer for every 2-3 hours. Take a break and have a light snack. • Have snacks like roasted peanuts/channa, dry fruits, puffed rice etc in your drawer. This will save a lot of time which you would've otherwise spent on going to the canteen. • If you get snacks like fruits, sprouts or buttermilk from home, keep it on your desk where you can see it. This will be a constant reminder for you to eat. • You can take help from your colleagues. You can either ask them to remind you or you can have a small group of friends and have snacks and meals together. This will also be a good stress buster. • Have snacks that are easier to carry, eat and something which you like. Do not carry fruits like oranges which require peeling. You can instead go for a banana or an apple. Time management is very important whether it is with respect to personal life, professional life or lifestyle. Start with small steps for a better you!